Collar 15" 15 1/2" 16" 16 1/2" 17" 17 1/2" 18" 19"
Chest 43 1/8" 46" 48 1/2" 50 1/4" 52 3/8" 54 1/2" 56 5/8" 60 7/8"
Sleeve Length 34 1/2" 35" 35 1/2" 36" 36 1/2" 36 1/2" 36 1/2" 36 1/2"
Waist 38" 40 1/2" 43" 45 1/2" 48" 50 1/2" 53" 58"
Waist Place the measuring tape against the skin around the fullest part of your waist, usually just above your hips. Hip The tape measure is placed around the hips being sure to incorporate the widest point of the seat. 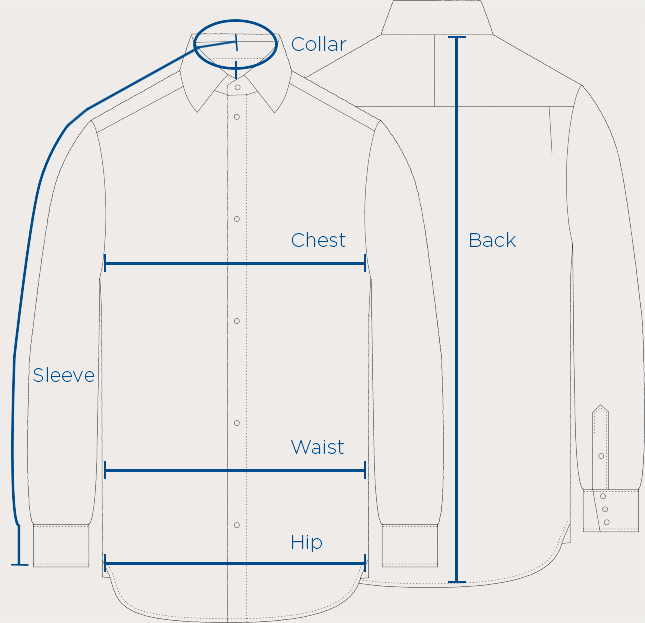 Body Hold the tape at the point where the seam of the shoulder meets the collar, and keeping it as straight as possible, measure downwards to where you desire the shirt to finish. An everyday shirt with a soft sentiment, this spring design uses miniature dots to created a subtle check pattern. The pastel purple tone is in line with summer's relaxed ambience while the Regent collar and traditional cuff ensure it maintains formal credentials. Pair this piece with tonal accessories for an easy way to summer smart. T&A shirts are handmade in our Gloucester factory, using hand-worked sewing machines operated by seamstresses with a wealth of experience. The patterns are cut from the highest quality cotton, with the separate pieces expertly brought together to create the final design. We finish the shirt with ethically sourced mother-of-pearl buttons, which are thermally fused to ensure they never loosen with wear; two branded collar stays are then placed into the collar for aesthetic and functional precision. Express Saver Shipping ($9.95) : All packages are shipped UPS. Orders going to New York and the tristate area will arrive in 2-3 business day. For all other states, please allow three to five working days from the date of dispatch. Express Saver Shipping ($19.95): All packages are shipped Express Saver to Canada. Please allow three to five working days from the date of dispatch. Customers are responsible for any import duties or clearance fees. Read more about delivery options. International Shipping ($49.95): All packages are shipped UPS Express Saver. Customers are responsible for any import duties or clearance fees. All international shipments will require a signature upon receipt. Unworn goods may be returned for a refund or exchanged within 30 days of purchase. All sale items are final sale and cannot be returned. Please note that original postage will not be reimbursed and return costs are not pre-paid.